The FSU is currently one of the world's major producers and exporters of oil and gas. In terms of produced oil, Russia alone ranks third in the world behind Saudi Arabia and the United States. In 1983, the USSR surpassed the United States to become the world's largest producer of natural gas and at present Russia remains in first place. Although oil extraction began on the Apsheron peninsula (Azerbaijan) as early as 1860s, accelerated development of hydrocarbon resources occurred in the 1970s and 1980s when the FSU attempted to improve declining rates of economic growth by the expansion of oil and gas production (Figure 20.2). The Tyumen oblast1 in Western Siberia is the most important hydrocarbon producing province (Table 20.2). The Tyumen oblast incorporates two administrative subdivisions: the Khanty-Mansy Autonomous Okrug (KMAO), the land of two indigenous peoples, Khants and Mansis, and the Yamal-Nenets Autonomous Okrug (YNAO), the land of Nenets. Most of the oil is found around the middle course of the Ob in the KMAO, while major gas deposits occur further north in the YNAO. The production takes place north of 60° latitude which predetermines severe environmental conditions. In the region of Russia's largest gas field, Urengoy, the air temperature is below -40°C more than 10 per cent of the time. The whole region is a swampy lowland underlain by permafrost in the northern taiga and tundra zones. A rapid growth of production occurred through the 1970s as a result of the discovery and exploitation of a number of extremely large fields. 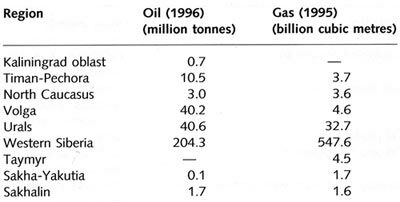 In 1980, a single giant oil field, Samotlor, which went into exploitation in 1969, produced 155 million tonnes or one-third of all cumulative withdrawals (Dienes, 1993; Sagers, 1996). Production focused on large fields, while a vast stock of smaller fields, which still represented significant deposits, remained underdeveloped. High-flow reserves provided not less than 95 per cent of all oil withdrawal (Dienes, 1993). A massive infrastructure had been created in the region to support this huge production. By the late 1980s, however, as an oil province Western Siberia had passed its peak (Dienes, 1993). The annual depletion of 'active' reserves in Western Siberia has more than doubled since the 1970s and the rising importance of 'hard-to-recover' reserves has led to a sharp increase in low-productivity wells. Between 1980 and 1991, the number of wells in the province increased by 5.6 times (Dienes, 1993), (i.e., more drilling and more infrastructure are required per smaller amount of oil). A rapid decline in reservoir pressure, another aspect of maturing oil fields, necessitated the use of secondary recovery techniques which required further investments. While production costs had been rising through the 1980s due to the physical changes in oil extraction, in the 1990s high inflation and subsequently higher costs of labour and equipment supplies drove oil production costs upward. At the same time, oil prices were fixed by the government below the international level. Under conditions of rising costs and falling output, investments into maintenance had virtually ceased (Sagers, 1996). A number of international loans was received by Russia (from the World Bank of Reconstruction and Development (IBRD), European Bank (EBRD), and other organizations) for the improvement of the ageing and deteriorating infrastructure; however, these loans have not been paid in full (Sagers, 1996). While the number of newly discovered large oil fields is declining, abundant gas resources have been found on the Yamal and Gydan peninsulas and also offshore in the Barents and Kara Seas (Clarke, 1991; Sagers, 1995) and development of 40 new gas fields by 2005 is planned. Not only does Russia have enormous reserves of gas, but these reserves are also characterized by an extremely high degree of concentration; in the 1990s just six fields accounted for 93 per cent of total gas production (Sagers, 1995). A decline in gas production, which has been observed through the 1990s, was associated with ongoing economic reforms while resources were not a constraining factor. High domestic consumption of gas and its increasing role as a major fuel used for power generation ensured that the decrease in gas production was small in comparison with general industrial decline. Despite the problems faced by the hydrocarbon industries in the 1990s, a long-term programme for exploitation of hydrocarbon resources in the north has been proposed which includes development of the offshore resources in the Arctic Ocean. 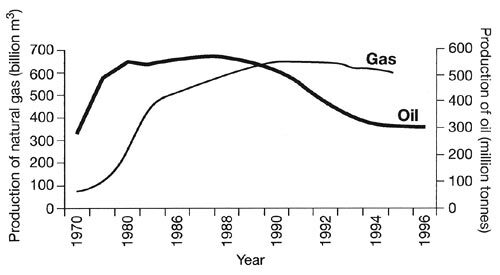 This brief overview of oil and gas development in the Russian north highlights the origin of environmental problems associated with production of hydrocarbons: (I) industrial output at the maximum level, in the shortest possible time and regardless of any (including environmental) costs during the Soviet period when rapid growth was achieved through extensive development rather than efficient use of resources; (II) collapse of the economy and acute underfunding in the post-Soviet time which account for the aged and dilapidated infrastructure which is prone to accidents and a high rate of waste. The same factors are responsible for the poor environmental quality in other oil- and gas-producing regions: the Caspian region which is the oldest oil-producing area with a history dating back to the 1860s, the Volga-Urals province, Timan-Pechora basin, Sakhalin, Turkmenistan, and Kazakhstan. In the north, however, a massive scale of production, remoteness of the area, and unfavourable natural conditions have resulted in the state of environment which can be only described as critical.